From surprise release to extreme popularity, Apex Legends has seen it all. For a time being, most of us thought that it will dethrone Fortnite and will become the new “King” of Battle Royale games. We were right to think so, because Apex Legends made a player base of more than 25 million players during the first week of release. Although, Fortnite is still leading the Battle Royale game race but it is safe to say that Apex Legends has crossed all the other similar category games like Call of Duty Blackout, Players Unknown Battle Ground (PUBG), Realm Royale and Island of Nyne. Out of this game, only Call of Duty is a famous and old franchise and it has taken a big hit after the release of Apex Legends. COD Franchise has also disabled its tracking system to hide the fall in player base statics. It is not difficult to imagine why. Apex Legends is not just another Battle Royale game. It gives you the feeling of Titanfall while playing and give you the choice to select a hero of your choice. 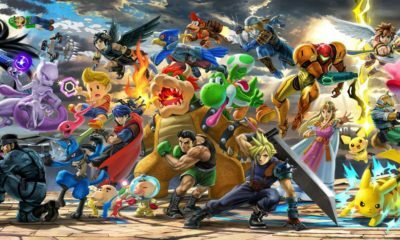 Every hero has unique abilities and in this way the game provides a unique experience for every player. One of the best features of Apex Legends is the weapons added in it. You can choose from a variety of different weapons. In this article we are going to talk about some of the best weapons to get your hands on in the game. Many weapons used in Apex Legends have been taken from Titanfall and they look really cool in the Battle Royale realm. Plus, their performance is also made better for a more competitive mode. Having a great number of Assault Rifles, Sub Machine Guns, Light Machine Guns, Sniper Rifles and handguns, it can be difficult to choose one. You must get to know the properties of the guns in order to understand their true features. If some player is killing rapidly with one weapon, it clearly does not mean that you have to pick that weapon as your first choice. It all depends on your playstyle and that is why we have collected some useful information about weaponry in Apex Legends that will surely help you in picking the best weapon of your choice and suits your playstyle. One way to choose the favorite weapon is by playing the game for a long time and after you feel comfortable with one weapon, you can hold onto it. But we surely won’t recommend it. Because by doing so, you’ll miss all the fun of using other guns who might be a better choice for you. More or less all weapons in Apex Legends are designed in a same way. It does not matter which type of gun you are using, they are all designed to be killing machines. Our first advice for you is if you feel comfortable with one and don’t mind its slow fire rate or high recoil, don’t change it. As said above, in the end it is all about fun and having your grip on a gun. Stats do not lie but they are not always right as well. For instance, SMG’s have better fire rate as compared to other weaponry but they have the second highest recoil (first one is the sniper rifles of course), so killing an enemy with an SMG from distance can be tricky. If you are comfortable with using Light Machine Guns at close ranges, you should use them with no care for what other use. This being said, there are some weapons in Apex Legends that are considered overpowered and are preferred over other weapons. Rarest weapons in the game are usually found in supply drop in placed in best loot locations. You should always go for them whenever you get a chance during the match. We have categorized the weapons according to their type so you may have a clear idea of which weapon deserves to be your favorite. 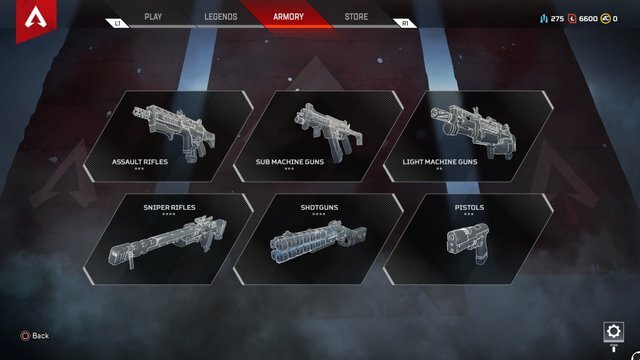 Apex Legends has three Assault Rifles in its storage including R-301 Carbine, VK-47 Flatline and Hemlock with each of them having different Headshot damage, Magazine size, Body Damage and Ammo Type. If you consider the table below, you can easily understand that Hemlock should not preferred upfront. It can be useful from medium distance but the first mode will leave you vulnerable at close range. While the other two guns, VK-47 Flatline and R-301 Carbine are fairly good at almost every range. While VK-47 uses Heavy Rounds to deal more damage, the high fire rate and space makes R-301 ideal and a better choice than R-301 Carbine especially in close combat. If you’d like to pick one out of these three great choices, we would suggest R-301 Carbine because of its all-round stats. Out of these four shotguns, Mastiff is extremely difficult and rare to find in Apex Legends. You’ll only find it supply drops. As this gun is highly recommended, we suggest that you grab it as quickly as you see it. Similar to Kraber, Mastiff fire unique bullets that can be replenished. You cannot find more of its ammo in the map and if you ran out of them, drop the gun because it will be useless. Its powerful pallets deliver extremely high damage to enemies and it is good for medium range as well. But you might want to shot the gun right in front of enemy because the fire rate of Mastiff is fairly low. If you are not comfortable with the most powerful shotgun in the game, we suggest that you try Peacekeeper. The other two guns do not come close to these two mentioned above. EVA-8 lacks the damage range. On the other hand, Peacekeeper is a beast when blowing damage to the enemies. Although its slow fire rate and extra reload time can make it difficult in tight situations but the gun certainly makes up for it with high damage. Mozambique pistol shotgun is also not a bad choice but it would not be our first preference our Mastiff or Peacekeeper. Read the following table to understand the features of shotguns in Apex Legends. Kraber is the only weapon to use unique ammo in Apex Legends, other than Mastiff. You can find its ammo anywhere and must survive with the ones you get with the gun. This is easily the first choice in sniper rifles as Kraber delivers 125 damage to the body in a single shot. You can find it in supply drops if you’re lucky enough. Don’t even think about missing it when you see it because you’d regret it for sure. Other than Kraber, there are two more guns that can be useful in Sniper category. You can attach several mods with Longbow DMR and make it a cracker. Also, if you land headshots with this weapon, it is surely a kill. Triple Take is the second option if you are not comfortable with DMR Longbow. It fires a burst of three shots in one go, making enemy an easy prey. If all three fire hits an enemy, they’ll deal more damage as compared to the DMR Longbow but you’ll have rare chances of delivering all three shots to a single enemy. You can make it deadlier by attaching the precision choke attachment with it to reduce the shot spread. We have enlisted all the sniper rifles that are available in Apex Legends and you can see for yourself which one will be better for you. Although if you heed our advice, our first choice would be Kraber then Longbow DMR or Triple Take which ever suits you best. Some players consider Sub Machine Guns in Apex Legends less effective as compared to the guns of similar category in other games. Normally, SMG’s are designed for close range combat and rush playstyle. Alternator is the sub machine gun with the smallest magazine size and it feels like getting empty in a second. This will be not be good in close combat as reloading in front of the enemies will surely increase your chances of dying. Prowler does deal heavy damage but it also fires in burst mode and hence it is not very useful in close combat. If we have to choose one weapon in this category, we would suggest R-99. It is a decent weapon with moderate damage and medium range. If you attach extended magazine attachment with, the gun can become somewhat useful. These were our best choices from Assault Rifles, Sniper Rifles, Shotguns and Sub Machine Guns categories. In the end, we cannot emphasize enough that it is all about having fun. If you’re having fun with a pistol, don’t even think about picking up shotgun or sniper rifle. Checkout some other guides on Apex Legends below.